We’ll take a purely data-driven approach to measure if Washington State’s legislative districts are gerrymandered. While there is no absolute mathematical definition for gerrymandering – and therefore no definitive test – there are good objective statistical tests to measure anomalies. This article focuses on applying these approaches to the legislative boundaries in WA state. First, we’ll look at the actual election results and see if there’s anything suspicious on the surface. Then we’ll run a standard statistical test – the McGhee test developed at the University of Chicago. And then we’ll run some generic algorithms to produce actually gerrymandered maps and compare to actual results. To simplify nomenclature throughout this analysis, we’ll provide summary from the GOP perspective. The results can all be directly flipped to switch to the Democrat perspective. (IE, almost always, a x% GOP result means a (100-x)% Democrat result). To simplify nomenclature, we’ll look at results from the GOP There’s no definitive criteria for creating district boundaries. Districts must be contiguous and similar in population. However, even these criteria are tricky. For example, a district boundary is set for 10 years, so as population grows and shifts over time, districts’ populations may shift. Districts can’t be simple shapes like hexagons because they may need to account for geographic boundaries or roads. Here is a map of legislative boundaries. Since districts are population based (and not based on square-miles), one can see the districts are more concentrated in dense population centers. WA has 49 legislative districts, and each district has 2 house members and 1 senate member. As of the last statewide legislative election in Nov ‘16, in the senate, the GOP / Democrat split was 24-25. In the house, the GOP/ Democrats split was 48- 50. Roughly 90% of the 49 districts have all three members from the same party, indicating that individual districts carry a definitive partisan bias. But when tallying up all the legislative races, the overall split is almost evenly divided between parties in both the house and senate caucus. So clearly the Republicans have done a better job in the legislature than at most statewide races. Only Kim Wyman has outperformed the caucuses. Some may suggest gerrymandering as the only way that the Republican caucuses could outperform statewide races. But a statewide race requires a single candidate to appeal to all 49 districts. 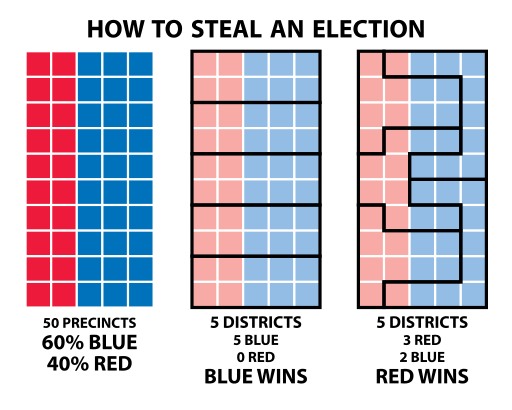 Whereas legislative districts have a different candidate per district, allowing each candidate to vary to “fit the district”. The real test of boundaries is to focus on a single partisan candidate and compare what percent of legislative districts they’d “win” to their statewide percentage. For example, Trump got 38.07% of the statewide vote. He also won 19 / 49 legislative districts, which is 38.78% – nearly the same ratio that he had statewide. That is a strong indicator that the districts aren’t gerrymandered. This analysis is looking at a broad range of races across a 15% spread. If the districts were actually gerrymandered, we’d expect that GOP candidates consistently performed better (or from the Democrat’s perspective, worse) in ‘% of district won’ than by ‘% of statewide vote’. But they do not. There’s an almost linear correlation between these results (R2=.83). Candidates that won more statewide votes also won more individual districts. Some GOP candidates benefit from the legislative boundaries, some performed worse. Unless you win a district with exactly 50%+ 1 votes, there are at least some “wasted” votes. large blowout victories and 49.9% “close calls” produce the most “wasted” votes. It then defines an “efficiency gap” as the (difference in each party’s wasted vote divided by the total vote). There is no definitive threshold for the efficiency gap that defines gerrymandering, but McGhee calculated the average efficiency gap in 2012 was 6%, and the egregious gerrymandering examples have are over 10%. The average gap from this spectrum of WA races is 3.2%, well below the national average. So our statistical test suggest that the districts are not gerrymandered. What would gerrymandering look like? A final approach we take is to work backwards: we can deliberately produce gerrymandered maps and compare them to the actual map. Here, we use a genetic algorithm, which starts with an initial configuration and then mutates it over a series of iterations as it “evolves” towards a goal. Mutations must preserve certain rules like contiguous boundaries. In this case, the goal was to maximize the number of GOP legislative victories, where victories where calculated using a Monte Carlo simulation driven by previous election turnout results from record poor GOP years. We used election results that initially gave GOP only 21 of the 49 districts – simulating a “worst case scenario” for GOP that put them near their historical lows. After series of genetic mutations, the final result was a map with 26 of 49 GOP wins – a pickup of 5 seats. The chart here shows the evolution progressing along the top. However, we notice that the boundaries here definitely look suspicious. They’re clearly warped and have unnatural borders designed to carve out an advantage. What this also shows is that truly gerrymandered results could produce a significant GOP advantage – even in a year with record poor Republican voter turnout. The legislative results are within proximity of the statewide governor results. And when measured across a wide range of candidates, there is no consistent advantage from district boundaries over a pure statewide vote. The house and senate GOP caucus performances do perform exceptionally well – particularly compared to the statewide performance of most GOP candidates. But this appears to be more due to the caucuses picking candidates to fit their district rather than gerrymandering. If we deliberately create theoretical gerrymandered districts via computer simulation, the potential GOP advantage would be significantly higher than what we witness. In the absence of any contradicting evidence, we would conclude that WA state’s legislative boundaries are fairly drawn and not gerrymandered.